Flip Pallot: RIDE…..Where does it come from and how can I get it? There’s no smoke, no mirrors and no mystery. It’s really just high school physics and good old common sense. As simple as it is, many manufacturers and even more boat owners have trouble putting GOOD RIDE together with a good fishing package. Achieving good ride from entry involves designing some vee or sharpness into the front portion of the bottom of a hull. Having this sharpness forward in a hull bottom allows the forward portion of the hull to cleave rough water thus providing good (smooth) ride. Sharp or deep entry as it is sometimes called, allows the designer to build a flatter running surface toward the rear of the hull. Flatter running surfaces are more “correct” and require less horsepower to achieve the same speed as steeper running surfaces. Flatter rear running surfaces also provide more displacement so such designs float is less water than steeper designs. 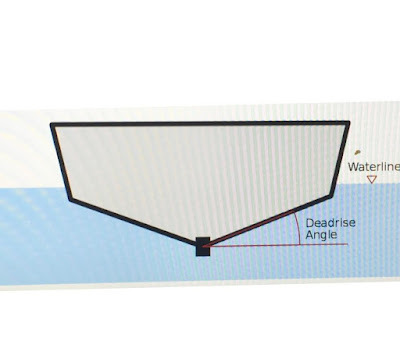 The design challenge is to build enough entry into the front of the hull so that the entry cleaves rough water before it reaches the flatter running surface yet rides high enough to remain out of the water in calm conditions allowing the hull to run on the flatter rear surface without drag from the entry. Sounds impossible. A great concept which would never work in real life. Basically true except for hydraulic or electric trim tabs. Sharp hull designers in this day and age build enough rocker into the bottom of hulls so that with trim tabs in the neutral position the hull will ride bow up (entry out of the water). Some designers even allow their hulls to porpoise with tabs in neutral but all designers realize the benefits offered by adjustable trim tabs. My belief is that virtually ALL BOATS can benefit from adjustable tabs properly used. 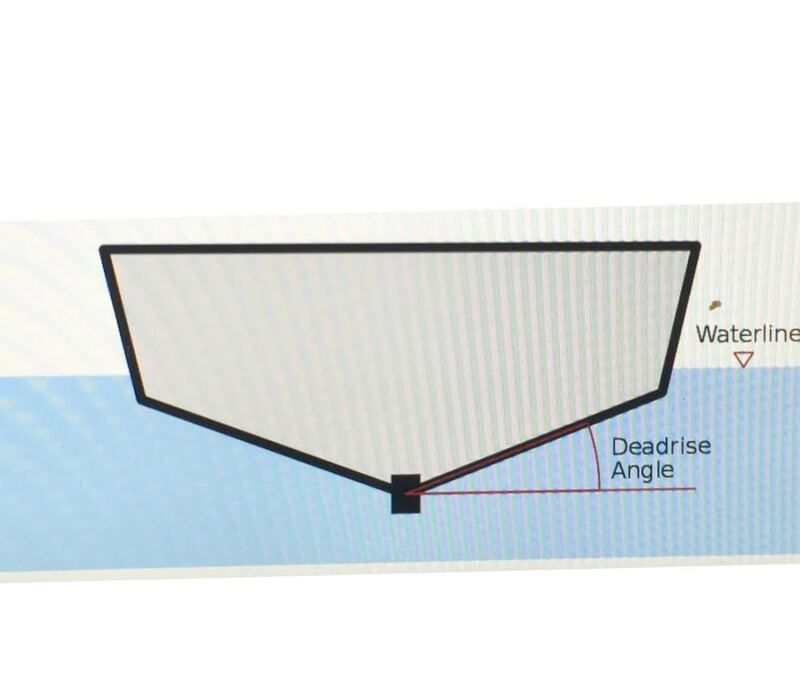 Hulls having deadrise greater than approximately 12 degrees (generally found in many skiffs) up to approximately 25 degrees (found in many offshore fishing and racing boats) tend to use hull angle further aft to achieve smooth ride. This also allows less of the hull bottom to be in contact with the water causing less drag and often dryer ride. At this point, even if you’re not reading between the lines, you’re beginning to see that there are areas of trade off and compromise in the arena of hull design. Each angler must determine what it is that he or she will be asking their boat to do during most fishing situations and select a hull design that will accommodate the broadest range of fishing situations. Forgetting about the interior layout of a fishing boat (which we will discuss at great length in future columns) here are some things to consider when deciding what features in a particular hull design will fit in with your fishing plans. There is a term which I love to use and hear used…… It is “Wretched Excess”. This term applies very nicely to the width dimension designed into many shallow water fishing boats these days. To qualify as a great fishing boat a hull doesn’t have to be as wide as an aircraft carrier. You do not need to be able to walk around the gunwale of a skiff without it tipping to one side or another. Tipping is a perfectly normal attitude for a skiff. In fact, there are certain situations where tipping can be a big help. Some years ago when we used to fish for very large jewfish (giant sea bass) we would often catch fish as large as several hundred pounds. To put such fish in the skiff we would actually tilt the skiff until a rear corner of the gunwale or covering board was at or just under the surface of the water and slide the large jewfish, shark or tarpon into the boat. Being able to tilt a skiff can often allow you to get into or out of shallower water than the boat could float in at normal attitude. Tilting can also help to get a boat on plane in very shallow water. Narrower hull designs normally produce better rides and certainly pole better than wider designs. The fact is that if most hulls were narrower , had less deadrise, some entry in front and some more displacement in the rear, they would draw less (float higher in the water), answer better at idle speeds and pole better. The trade off might be that the boat would be slightly more “tippy” (not much because of the increased displacement aft)……… who cares, that’s what boats are! In the 1960’s the concept of deadrise or deep vee hull design found it’s way into the off-shore ocean racing scene. It was very successful in that world and allowed highly powered race boats to go very fast through very rough seas, actually leave the water and land on the heavier (because of engine weight) rear end of the boat yet land softly because of the vee or deadrise in the hull. Deep vee hulls dominated offshore ocean racing in those years. It didn’t take very long for this technology to find it’s way into the offshore fishing boat market and before long companies such as Sea Craft, Bertram, Sea Bird, Wellcraft, Speedcraft, Formula and others were introducing fishing machines which incorporated the deep vee concept. It made perfect sense……. Folks were traveling further over rougher seas to get to remote fishing locations. Greater speed and better ride were needed and so the concept was embraced by the offshore market. Unfortunately, deadrise found it’s way into the inshore market as well. Small boat manufacturers discovered that they could make their boats ride better if they incorporated some deadrise into their hull designs. To float the additional deadrise they had to build in more hull width to gain some displacement…….so boats got wider. As they got wider they got heavier and required more horsepower to make them go……bigger motors made them heavier still and harder to pole and fish. The size/weight/power pyramid developed a life of it’s own and instead of people learning how to properly drive and use smaller, better fishing boats many just settled into bigger, smoother, faster less efficient fishing skiffs. The average shallow water production fishing skiff on the market today draws in excess of nine inches, weighs well over one thousand pounds and is wider than it needs to be. Many excellent anglers that I know begin fishing for bonefish, redfish and snook in five or six inches of water. Areas unreachable by 99% of so called flats skiffs. All this so that folks can speed in complete comfort across choppy water to great fishing spots in boats that cannot get there until the tide is halfway in and the fish are spread from here to Key Largo. Forget about the fuel that their 150 H.P. Engine burned getting them there or the total outfit weight that they will have to pole around the flat all day. So What’s my point? It’s merely this……… If you’re fishing offshore and speed and really rough water are considerations, a hull with serious deadrise may be what you need for most of your fishing situations. But, if most of your fishing will be done in very shallow water you may want to rethink the party line regarding skiff dimensions and bottom configuration bearing in mind that a fishing boat should above all FISH WELL! Getting there in a true fishing boat may require you to tune up your seamanship and boat handling skills, but once you’re in the fishes house you’ll be needing a boat that will get you in and out of the neighborhood.